Okay, everything looks clear. Website appears to be clean again. 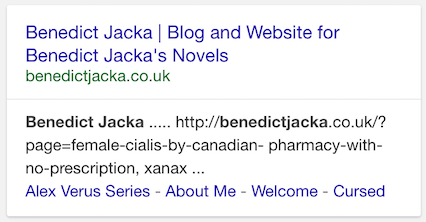 Sometime a while ago (at least as early as June 2015, if not earlier) this website was infected by a Pharma Hack. The way the hack works is to create a large number of hidden links on the infected website advertising drugs from an online pharmacy. The goal of the hack is not to get you to click on the links – the goal is to use the links to boost the online pharmacy’s Google ranking. For those wondering why this is important: you know how when you do a Google search for something, some results will be right at the top of the first page where everyone will see it, while others will be hidden down in page 5 or 10, where almost no-one looks? What determines that is the website’s search engine ranking. Making your website appear high up on Google results is called SEO (search engine optimisation), and it’s big business. SEO can be done legitimately (‘white hat’) or illegitimately (‘black hat’). The Pharma Hack approach (a.k.a. spamdexing) is very much black hat. For those who want to know more, the Pharma Hack blog has a ton of info on pharma hacks, including how they work and ways to combat them. The site’s now been cleaned, the spammy links have been terminated, and the backdoors the hackers used have been flushed out as far as we can tell. New security measures have been put in place, but please do contact me if you see any signs of pharma spam on this blog dating from November 2015 or later. Michael VanDeMar has a step-by-step guide on how to clean a hacked WordPress installation. His tutorial’s available for free, but he’s also willing to do it for you for a pretty reasonable fee. I recommend giving him a look if your own site’s been compromised. My web host, Vidahost, were also helpful – they weren’t able to fix the problem themselves, but they gave me good advice and over the years I’ve used them they’ve been good with phone support. I’d recommend them if you’re looking for a hosting service for a site of your own. And that’s it, at least for now. Right, back to writing. I’ve noticed unscrupulous competitors of mine link bombing my pages. Among other reasons I think it’s a ploy to get a site “google slapped” so it either reduces your page rankings or eventually leads to your site being de-indexed. WP comments, tend to be bots, but in your case a direct hack is more of a concern.